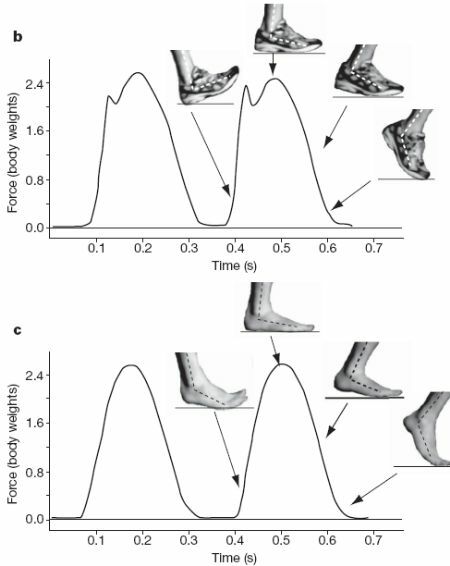 There is a new paper out in Nature about barefoot running which examines foot strike patterns versus shod running. The article is Foot strike patterns and collision forces in habitually barefoot versus shod runners from lead investigator Daniel Lieberman of Harvard. 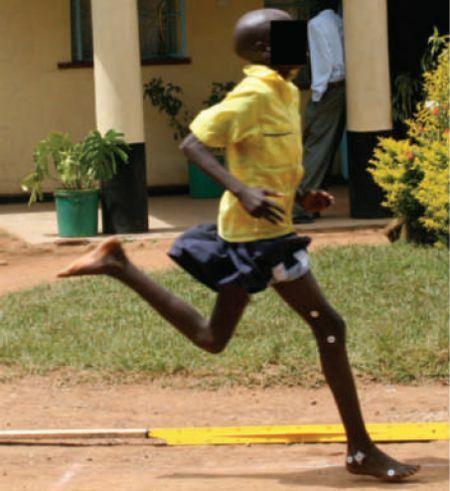 There is also a “News and Views” article by William Jungers commenting on it: Biomechanics: Barefoot running strikes back. Already, the Los Angeles Times has an article about the story: Study on evolution of running finds going barefoot good for the sole, better for the heels. If you try to heel-strike while barefoot, the transient is even quicker and higher, because there is not all that shoe cushioning. So, if you try to run barefoot that way, you very quickly learn that front-foot or mid-foot striking is the way to go. And that is also what Dr. Lieberman found. Folks who regularly run shod automatically heel-strike. In fact, the raised heel of running shoes actually encourage hitting with the heel first, since the ankle has to be flexed that much more to try to land on the mid or front of the foot. Folks with any amount of experience running barefoot automatically switch to a mid- or front-foot strike. You can see that in action in the following two photos, from Jungers’ article. 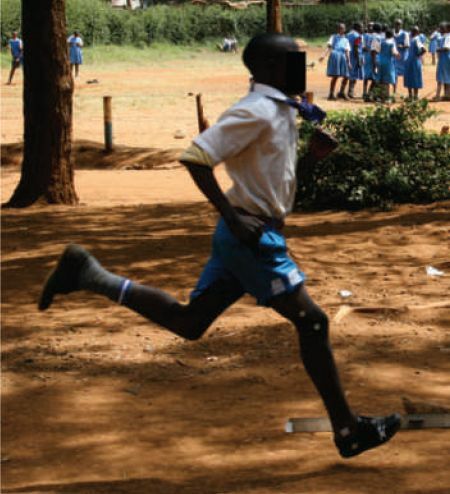 Both of the Kenyan youths pictured grew up barefooted, but started wearing shoes fairly recently. You can see the front-foot landing for the barefooted youth, and the heel-strike landing for the shod youth. Differences between [rear-foot strike] and [front-foot strike] running make sense from an evolutionary perspective. If endurance running was an important behaviour before the invention of modern shoes, then natural selection is expected to have operated to lower the risk of injury and discomfort when barefoot or in minimal footwear. Most shod runners today land on their heels almost exclusively. In contrast, runners who cannot or prefer not to use cushioned shoes with elevated heels often avoid [rear-foot strike] landings and thus experience lower impact transients than do most shod runners today, even on very stiff surfaces. As a result, we found no significant differences in rates or magnitudes of impact loading in barefoot runners on hard surfaces relative to cushioned surfaces. Evidence that barefoot and minimally shod runners avoid [rear-foot] strikes with high-impact collisions may have public health implications. The average runner strikes the ground 600 times per kilometre, making runners prone to repetitive stress injuries. The incidence of such injuries has remained considerable for 30 years despite technological advancements that providemore cushioning and motion control in shoes designed for heel–toe running. Although cushioned, high-heeled running shoes are comfortable, they limit proprioception and make it easier for runners to land on their heels. Furthermore, many running shoes have arch supports and stiffened soles that may lead to weaker foot muscles, reducing arch strength. This weakness contributes to excessive pronation and places greater demands on the plantar fascia, which may cause plantar fasciitis. Although there are anecdotal reports of reduced injuries in barefoot populations, controlled prospective studies are needed to test the hypothesis that individuals who do not predominantly RFS either barefoot or in minimal footwear, as the foot apparently evolved to do, have reduced injury rates. While there are still no decent studies that compare injury rates between shod and barefoot runners, every study like the one above should certainly make the public (and officials) more amenable to recognizing barefoot running. As I mentioned to Justin over at http://birthdayshoes.com, looking at that near vertical impact curve on the heel-strike graphs, I’m reminded of the saying: It’s not the fall that kills you, but the sudden stop. Nice write-up Robert. Hopefully, if there are enough articles and studies like the one referenced in Nature it will result in further studies that provide other than anecdotal evidence about the physical impacts of running in cushioned shoes. After that, who knows? Maybe being barefoot won’t be seen as such an oddity and will become more widely accepted. Study schmudy. I want to go race with those kids! They could teach me a thing or two, I’m sure. Hey Paleo Dan. I’m totally using that. Great article, I am happy that barefoot running studies are finally going mainstream. A greater realization would be more tolerance for barefooting in general!